Abstract: Inspired by the tropical fish neon tetra, we report a mechanism to achieve dynamic iridescence that can be magnetically tuned. This approach is based on the tilting of periodic photonic nanostructures, as opposite to the more common strain-induced color tuning. In this method, a periodic array of magnetic nanopillars serves as a template to guide the assembly of iron oxide nanoparticles when magnetized in a liquid environment. The periodic local fields induced by the magnetic template anchor the assembled particle columns, allowing the structure to tilt about the base when the angle of the applied field is changed. This effect emulates a microscopic “Venetian blind” and results in dynamic optical properties through structural coloration that is tunable in real time. The fabricated prototype demonstrates tunable reflectance spectra with peak wavelength shift from 528 nm to 720 nm. The magnetic actuation mechanism is reversible and has a fast response time around 0.3 s. This structure can be implemented on an arbitrary surface as dynamic camouflage, iridescent display, and tunable photonic elements, as well as in other applications such as active fluidic devices and particle manipulation. 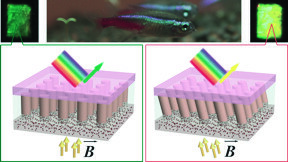 “Neon tetras can control their brightly colored stripes by changing the angle of tiny platelets in their skin,” says Chih-Hao Chang, an associate professor of mechanical and aerospace engineering at North Carolina State University and corresponding author of a paper on the work. The color-changing material has four layers. A silicon substrate is coated with a polymer that has been embedded with iron oxide nanoparticles. The polymer incorporates a regular array of micron-wide pedestals, making the polymer layer resemble a LEGO® brick. The middle layer is an aqueous solution containing free-floating iron oxide nanoparticles. This solution is held in place by a transparent polymer cover. “For example, we were able to change the perceived color of the material from dark green to neon yellow,” Luo says. The work was done with support from the Defense Advanced Research Projects Agency, under grant W911NF-15-1-0108; and the National Science Foundation, under grant 1552424.